Product #12294 | SKU Duet for iPad/Mac | 0.0 (no ratings yet) Thanks for your rating! 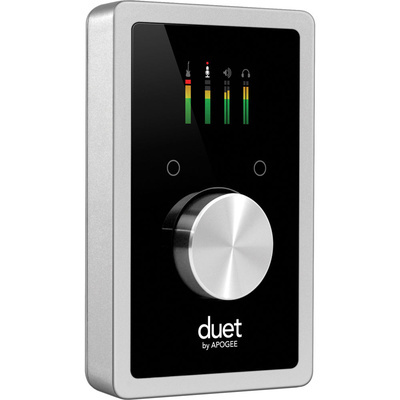 The Duet USB Audio Interface for iPad & Mac from Apogee is a portable audio interface that builds on the success of the Duet 2 by adding compatibility with iOS in addition to Mac. It provides a direct digital 30-pin connection that allows for DC charging of the Apple device. This interface is more than capable of making studio quality recordings of vocals, guitars, bass, keyboards, drums, and anything musical. Because of its portability, you are ready to create at any time. And while the high-gain microphone preamps capture performances with clarity, the outputs are also capable of presenting incredibly detailed and dimensional sound. The dual microphone preamps feature enhanced components and seamless, click-free transitions throughout the 75dB of gain. The preamps are optimized for any sound source, so no matter what's being recorded, it get's captured in every detail. The AD/DA converters are also an all-new design, delivering the purest recordings and best listening experience possible. A full color, high-resolution OLED display is the main control center for the Duet, providing visual feedback for multiple functions including metering, numeric value for input and output levels, input grouping, phase, muting, phantom power and Soft Limit indication. The display provides immediate status of the inputs and outputs without having to refer to Maestro or the host recording software.